If you’re looking for a home remedy for cough, our all natural lemon honey ginger syrup is the perfect solution! This home remedy for cough is not only simple to make, but it’s also all natural and delicious. 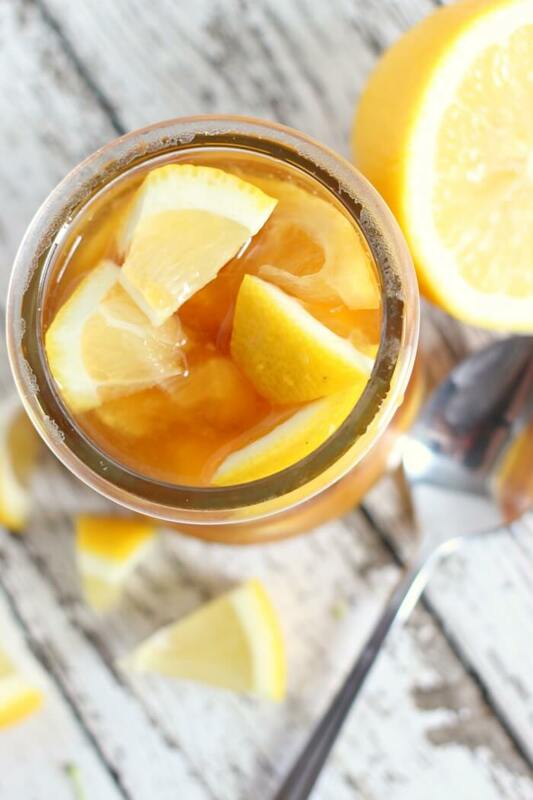 Honey, lemon, and ginger come together to make a soothing cough syrup or tea base. We all wish we knew how to cure a cold and while this won’t stop a cold in its tracks, it will make you feel a whole lot better. Try it with some homemade chicken noodle soup, roasted bone marrow, and a cup of piping hot bone broth. You’ll be good as new in no time! How do you stop a cough naturally? 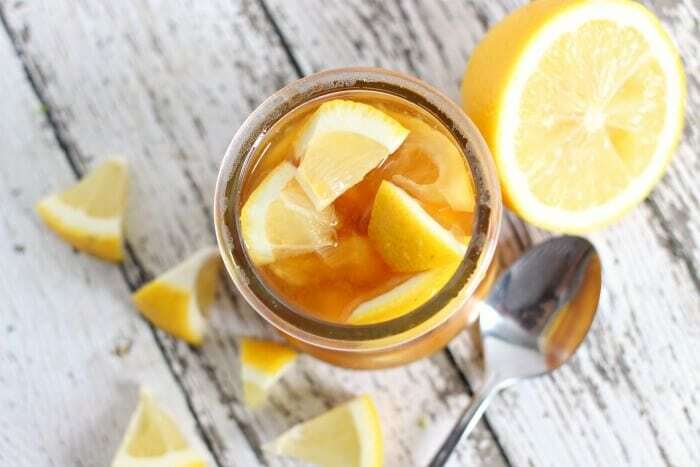 The combination of lemon, honey, and ginger is the ultimate home remedy for cough and sore throat, and is a great way to stop a cough naturally. This syrup is super easy to make, and you can take it by the spoonful (YUM), add it to a glass of hot water, or stir it into your tea. Honey is a natural cough suppressant because it stimulates the salivary glands and induces the release of the mucus through the airways – it is also a mild antibiotic. Ginger is known for is antitussive abilities – meaning that it can relieve and suppress coughing. Lemon is both rich in vitamin C an has strong antibacterial and antiviral properties. What is the best cold remedy? The best cold remedy is always going to be lots of rest and lots of fluids. If at all possible, take a full day off and sleep as much as possible. Zinc can also help shorten the length of a cold if taken within 24 hours of the onset. 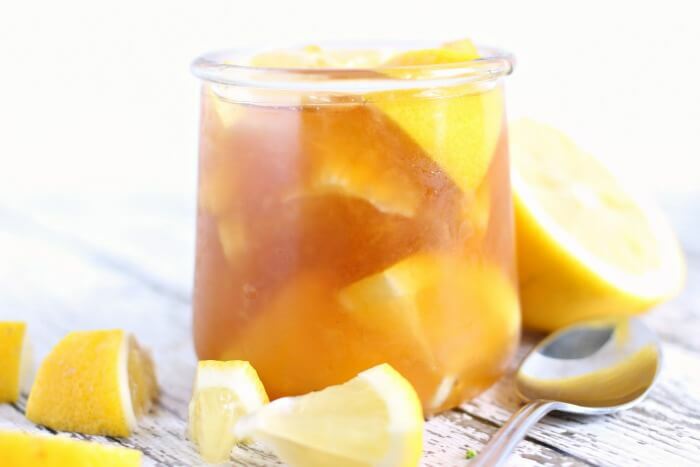 While you’re resting, try easing symptoms with our Lemon Honey Ginger Cough Syrup. It’s full of vitamins, is good for soothing coughs and sore throats, and can help you sleep better. Honey – Any type of honey will work, but we like to use a local raw honey. Raw honey is honey that hasn’t been heated and it contains natural vitamins, enzymes, and powerful antioxidants. Raw, local honey also contains a blend of local pollen, which may strengthen the immune system, and reduce pollen allergy symptoms. Lemon – Make sure to rinse your lemons well as you’ll be using the entire lemon, rind and all. Try to remove as many seeds as possible too. Ginger – You can chop or grate fresh ginger, but to be honest a lot of times I use squeeze ginger. It’s pre-grated and you keep it in the fridge. Works really well – you’ve seen it before in our salmon marinade recipe! 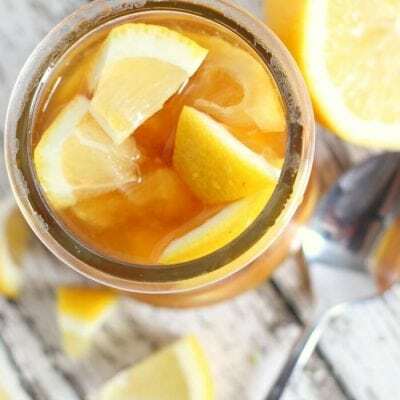 Let the honey lemon ginger syrup steep in the fridge for at least 24 hours before you use it. You’ll find that the acidity of the lemon breaks down the honey and thins it out. When the homemade cough syrup is ready, you can take a spoonful or two straight (my personal favorite way), you can add it to a mug of hot water, or you can stir it into a cup of hot tea. And don’t forget the lemons! After a few weeks, the lemons will be candied and delicious from steeping in the honey and ginger. Dig those out (with a clean spoon) and enjoy! Mason Jars – We store our magic pan release in mason jars in the fridge. I’m a fan of the wide mouth jars so it’s easy to get the brush in and out and make sure you’re getting all the goop. Ginger Grater – This little tool is great for grating ginger, or zesting citrus. It’s a must-have in the kitchen. Squeeze Ginger – I’m a total ginger cheater. We love using the squeeze ginger (and squeeze garlic). Sometimes you just need a shortcut. And that’s ok! Get Well Care Package – Are you looking at this recipe because someone you love is sick? Get them a care package! Are you looking at this recipe because you’re sick? Get yourself a care package! Self care is important, yo. Chicken Noodle Soup – This chicken noodle soup recipe is one of my personal favorites. It’s rich and tasty, and even if your body doesn’t need healing, it will do a good number on your soul. Roasted Bone Marrow – I know this is a tough sell for some folks, but bone marrow is rich in minerals that support the immune system and contains healing compounds like collagen, glutamine, glycine and proline. Bone Broth – If you can’t do straight marrow, try making a bone broth by simmering chicken or beef bones with vegetables and spices for several hours. Roasted Garlic – Garlic has antibiotic properties and it also builds the immunity against common cold. I always make a big batch of roasted garlic as soon as I start feeling sick. Doesn’t hurt that it’s super delicious too. You can also watch us make this home cough remedy on YouTube! Make sure to tune in for all our live cooking shows! If you're looking for a home remedy for cough, our all natural lemon honey ginger syrup is the perfect solution! 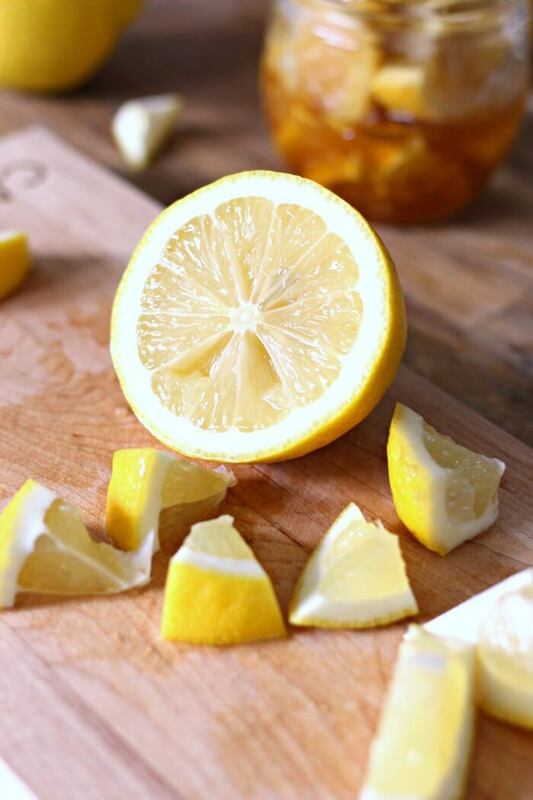 Chop or slice lemons into small pieces. Remove the seeds as much as possible. 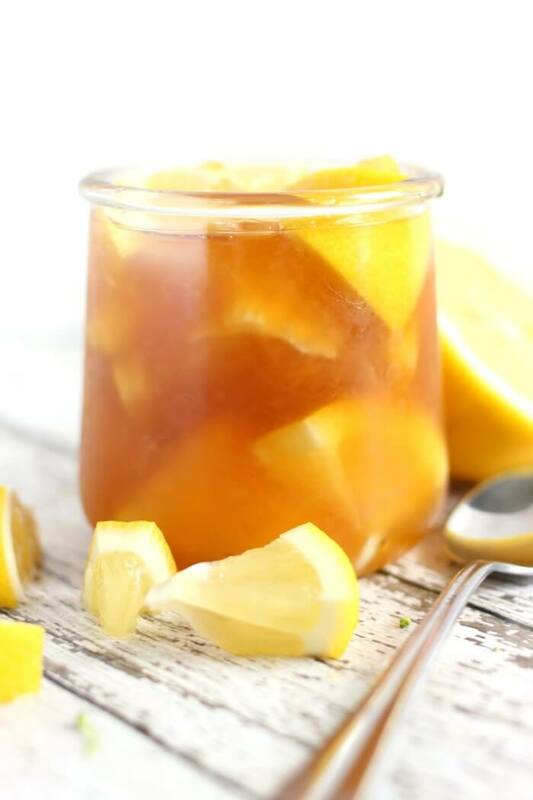 Fill mason jar with lemon slices, then add 1 tablespoon of grated or chopped ginger per lemon. Fill remaining space with honey. Refrigerate at least 24 hours before using. Take by the spoonful, add to a mug of hot water, or stir into your tea. I definitely need to bookmark this for next time I get sick! 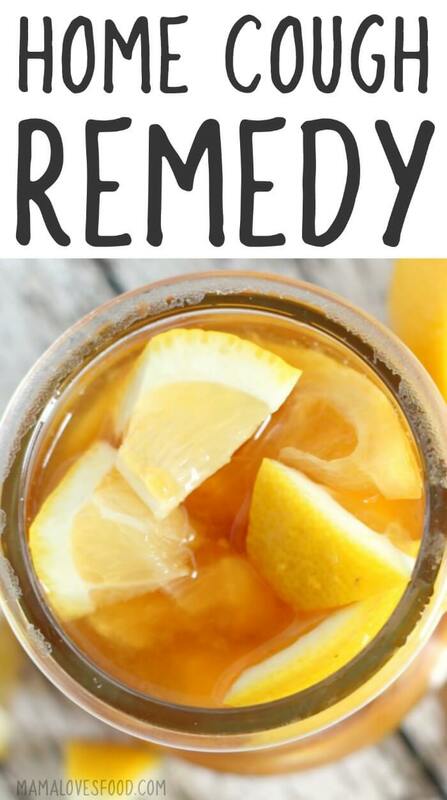 Having a cough you can’t get rid of is the worst and this looks both helpful and tasty! I may have missed this info. How long can this last in the fridge?